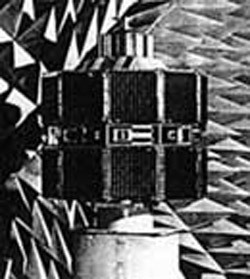 The LES (Lincoln Experimental Satellite) series were spacecraft designed and built by the Massachusetts Institute of Technology Lincoln Laboratory as part of the Lab's Air Force-sponsored program in space communications. Their goal was to test realistically, in orbit, new devices and techniques developed for possible use in satellite communication systems. LES-5 was designed to aid in the development of a tactical satellite communication system for the Department of Defense and was used for the first-ever satellite communications among Army, Navy, and Air Force units. All spacecraft in the LES series were launched from Cape Canaveral.